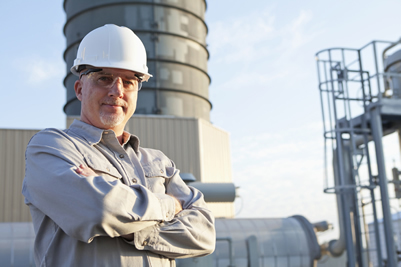 We have the technical expertise to get your job done right. 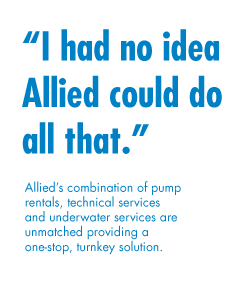 Many know Allied because of our pump rental services and for our knowledge of system hydraulics that make difficult jobs look easy. But we are experts in water/wastewater systems and in underwater construction as well. No one else in the U.S. brings our diverse disciplines under the same roof to deliver a comprehensive solution for your project. We will respond to your emergency anytime. Emergencies don’t wait for normal business hours. So we are available any hour of the day or night to respond to your emergency situation, no matter how big or small. As leading pump distributors for Kentucky, Ohio and beyond, we are always committed to solving pumping problems, whenever they occur. Our equipment makes your life easier. Just turn the key and the pump does the rest. No worrying about the pump going dry. Our pumps can operate indefinitely in dry or low-flow conditions without damage. We are committed to solutions. We don’t just deliver equipment and leave you to sort out the mess. We are your partner for the duration of the job, and we will provide as much support as you need to get the job done. We can provide a supervisor to help your crew. We can set up the equipment, leaving your crew to do what they do best. And we can even operate the equipment, day and night, making sure everything goes just like it should.